Spring Farm Alpacas was established in Sussex in 2000 with the purchase of three top quality white Peruvian huacaya female alpacas. Our first suri alpacas followed soon after. Our aim is to constantly improve the genetics and phenotype (appearance) of each generation of alpaca offspring – by careful selection of herd sires. 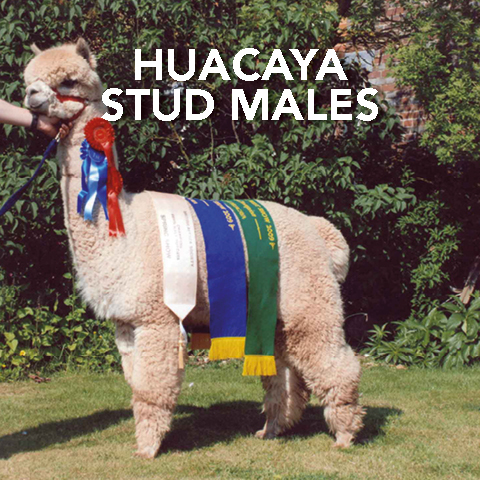 Spring Farm Alpacas now boast some of the best genetics the world has to offer including Accoyo and Snowmass in huacaya bloodlines – MacGyver and Torbio in suri bloodlines. 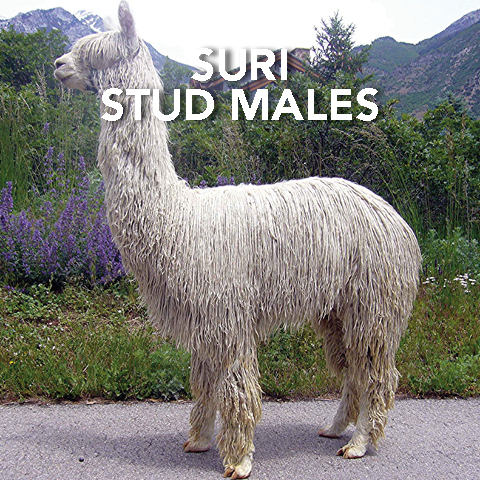 Our herd now numbers approximately 110 alpacas – both huacaya and suri (and six llamas). We can now offer a range of friendly alpacas for sale from friendly pet to show champion standard – and in most colours. 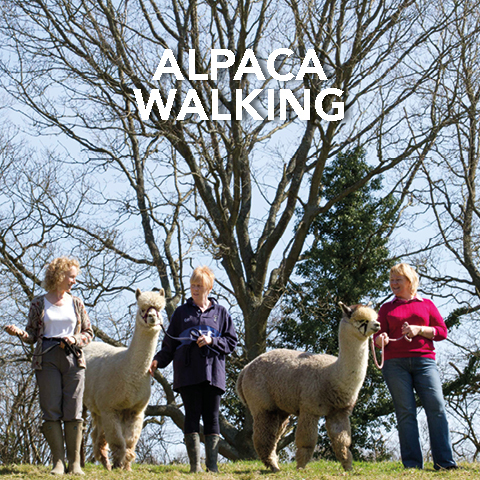 Spring Farm Alpacas is situated in the High Weald Area of Outstanding Natural Beauty, just outside the picturesque village of Fletching, in East Sussex. Whilst based in East Sussex, Spring Farm Alpacas is conveniently situated for West Sussex, Surrey, Kent, Hampshire and across the Home Counties and we have clients with our alpacas all over the UK and continental Europe (Sweden, Belgium, France and Italy). Over our years here at Spring Farm, we have improved our grazing through the seeding of wildflowers in our fields as part of our commitment to Countryside Stewardship (now Higher Level Stewardship) and our alpacas health. We now farm approximately 110 acres of pasture and woodland – producing our own wildflower hay and haylage – with all our farm facilities now customised for use by the alpacas. We offer alpacas for sale, alpaca walking allied to the best back up and training you can get. 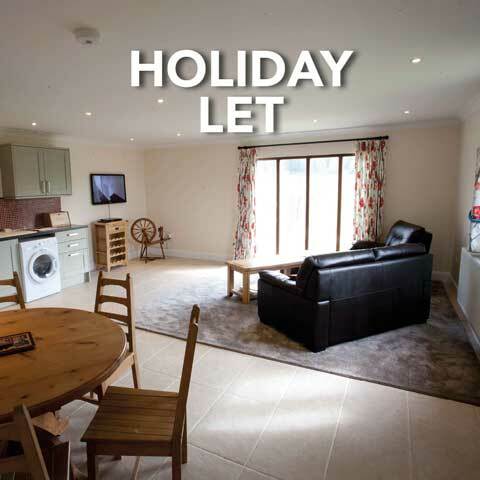 And, from Summer 2014, a holiday let with a difference! While neither of us come from farming families, we are both extremely interested in wildlife and conservation. Chris has been a keen fisherman since childhood, now allied to wildlife photography. Vicki has a scientific background in zoology, and studied fish biology at Masters level. We both devote our time to the farm and the alpacas – and to our clients to whom we provide a “second to none” back-up and full training in all aspects of alpaca ownership and handling. 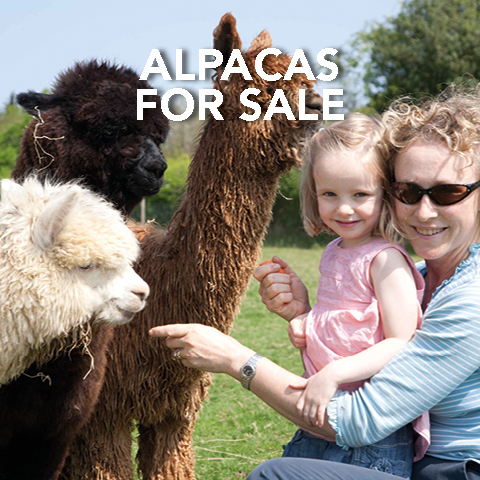 THE “MOST FRIENDLY HERD OF QUALITY ALPACAS FOR SALE IN SUSSEX, SURREY, ESSEX AND KENT AND POSSIBLY THE WHOLE UK”. We are breeders of both huacaya alpacas and suri alpacas. We are a medium sized breeder (approx. 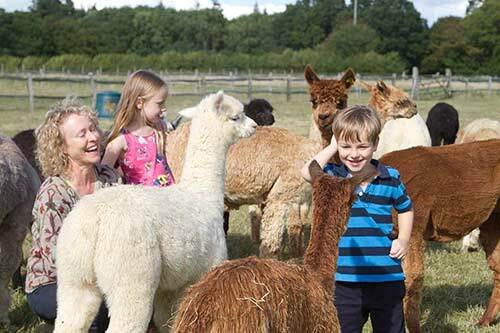 110 alpacas) based in East Sussex but convenient for West Sussex, Surrey, Essex, Kent, Hampshire. We regularly deliver alpacas (in our custom designed and built van) throughout the whole UK and offer a professional export service throughout Europe (having exported to Sweden, Belgium, France and Italy). We pride ourselves on our handling and haltering techniques, husbandry and back-up. 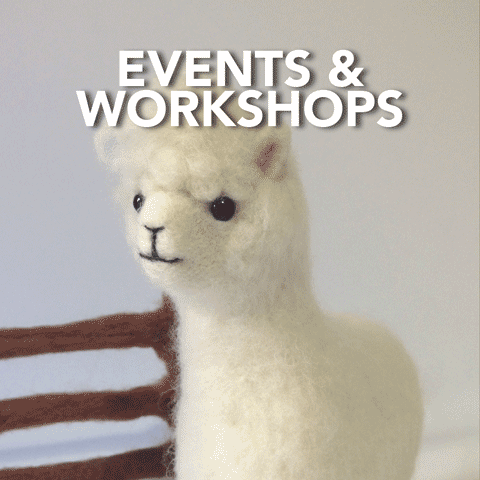 For a completely different alpaca experience and to see our alpacas for sale, come and meet us, our alpacas and discover how manageable alpacas can be. We always have a wide selection of alpacas for sale – including pregnant females (some with crias at foot); young males and females; wethers and both stud and potential stud males. Our for sale section gives an idea of our available stock – but in addition, we can put together sale packages and we rarely list all our alpacas for sale so if you were looking for a particular colour or group size we can almost certainly accomodate you. Given our experience, we are very happy to guide you through the whole process whether you are looking for a starter herd – or to discuss individual requirements for an established herd. We also offer husbandry days for new owners which gives complete peace of mind prior to delivery. We have found that adding a Spring Farm Alpaca to an existing herd can dramatically increase the friendliness of that herd. Given that alpacas are really intelligent and inquisitive – one confident and friendly alpaca can transform a more “timid” herd. We can help you learn about all aspects of alpaca handling and husbandry on a one-to -one basis, plus birthing and re-mating – and we are always available to help with comprehensive back-up and advice. 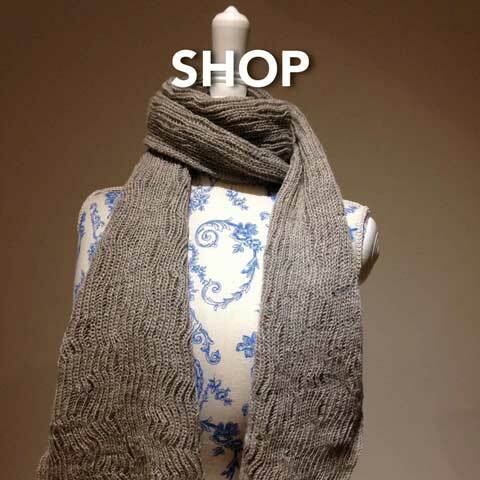 We hold regular workshops and talks on every aspect of alpaca fibre including assessing fibre quality. We can also help you halter train your alpacas and skirt (prepare) your fleeces for showing. 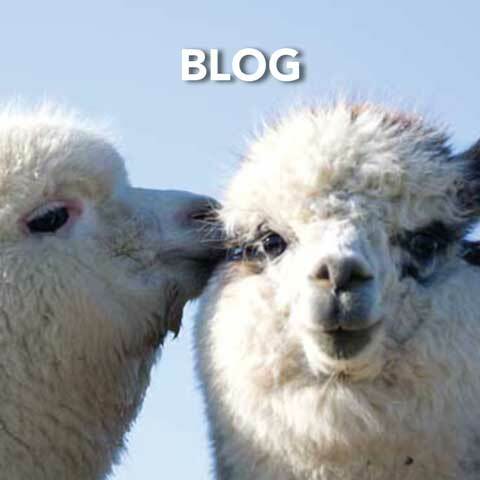 We would love to show you what enchanting animals our alpacas are. It is only on a farm such as ours where the alpacas are treated as individuals with our time, kindness and experience that you would get a herd of alpacas as relaxed and friendly as ours. ALPACA ENTHUSIASM, KNOWLEDGE AND EXPERIENCE. We started with a little knowledge and a lot of enthusiasm. Over the years since, we have attended courses, seminars and conferences to improve our understanding and ownership skills of these fabulous creatures both in terms of husbandry and fibre. 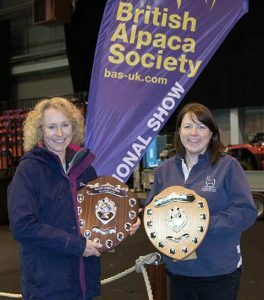 Vicki qualified as a British Alpaca Society Judge, previously chaired the South East Alpaca Group and remains heavily involved, and is on the joint Health and Welfare Committee (for BAS and BCA – we are members of both) and Fibre Committee (BAS). Given what we now know, our aim is to produce healthy, relaxed, extremely friendly and well trained alpacas, who will produce fabulous fibre for us (and you!) – for many years. We have taken the utmost care of our herd in biosecurity terms for the last 12 years. In considering any purchase from us, we are happy to discuss all aspects of biosecurity and are always willing to conduct any tests you may require for complete peace of mind. In October 2017, as a result of our walking alpacas with the public, we decided to undertake a surveillance test of all our walking team and a representative sample of each of our alpaca groups using the Emferplex test. We had a completely clear test with no single antigen positive (or above) results for either our alpacas or llamas. We keep historical records of all our alpacas health and would be delighted to share this with you. If you just wanted a quick snapshot of Spring Farm, why not click below to see a short film about Spring Farm Alpacas by Lucy Skone.